Despite not being one of the aims of 2Tone, the label was responsible for several singles and albums which were recognised the y British Phonographic Industry (BPI) for their sales figures. The BPI’s Certified Awards (silver, gold and platinum discs to you and I) are issued for full-price albums to recognise sales of 60,000 (silver), 100,000 (gold) and 300,000 (platinum). For singles the thresholds were 250,000, 500,000 and 1,000,000 when the label was active. Since 1989 they have been 200,000, 400,000 and 600,000 respectively. Dealing with the singles first it is somewhat remarkable that the label’s first single, Gangsters by The Specials, had sold 250,000 copies to go gold by 1 September 1979. Proving this was no fluke, the same sales award was quickly achieved by The Specials with Message To You Rudy and The Beat’s Tears Of A Clown. It’s worth pointing out that the awards are for sale to retailers NOT by them. This is most obvious when a record qualifies for an award before (or on the day of) its release. This was the case with Too Much Too Young, giving The Specials their third silver disc from three singles. Too Much Too Young’s award date was 1 January 1980. This was a busy day for 2Tone as Message To You Rudy and Tears Of A Clown both qualified the same day. There was then a quiet period as The Bodysnatchers and The Selecter dominated the release schedule for most of 1980. The next 2Tone single to receive a silver disc was Do Nothing by The Specials, which was recognised on 1 January 1981. It’s probably not that big a surprise that the next big 2Tone single was next to be recognised. On 1 July 1981 Ghost Town received two awards, going silver and gold on the same day. At that stage six of the label’s sixteen singles had gone silver and one had gone gold. It is even more remarkable when you consider that the majority of 2Tone’s releases to that point had been on 7” vinyl only. Granted there were paper and plastic labels for most releases, but Ghost Town was the first 2Tone single to also be released as a 12” single. All single sales were based on the humble 7”. The label eschewed formats such as picture discs, cassingles, poster bags, double packs et al. Hell, only Too Much Too Young, Do Nothing and Ghost Town had the luxury of a picture sleeve! 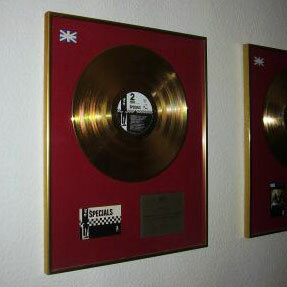 To date no other 2Tone singles have received an award. The reason I say to date is because in the modern digital world there has been an important change in the way awards are made. Originally the record label would have to apply to the BPI for certification . In July 2013 rules changed so that records are automatically certified on reaching sales thresholds. This has meant that the BPI has retrospectively been making awards, often to previously unrecognised titles, based on sales since 1992 (when the Official Chart Company took over compiling the charts in the United Kingdom). I’ll come to those awards soon, but before that I must deal with the 2Tone albums which received awards when still on general release. The first award was to Specials on 15 November 1979 for 60,000 sales. It was declared gold barely a month later on 11 December 1979 for 100,000 sales. Not to be outdone Too Much Pressure by the Selecter went silver on 21 February 1980 and gold on 30 May the same year. So the label’s record stood at two gold records from its first two releases as it prepared for the third. More Specials was that third release and it had gone silver by 29 September 1980 and raced to its gold disc by 8 October 1980. The next 2Tone album release was the film soundtrack Dance Craze featuring The Specials, The Selecter, The Beat, Madness and The Bodysnatchers who had all been signed to the label and Bad Manners who were associated with the ska revival that 2Tone had been a major part of and had featured in the film. Dance Craze was another album that was quick out of the blocks going silver on 9 February 1981 and gold two weeks later, on 25 February 1981. The next releases on 2 Tone were not commercially successful. In the case of Rico’s two albums they were arguably not meant or expected to be. The same could not be said for the compilation album This Are 2Tone and the Special AKA’s post Fun Boy Three album In The Studio. None of these albums were certified by the BPI. In fact ten years passed before the next 2Tone album that could be called a bona fide success. Singles by The Specials compiled the singles by both line ups Jerry Dammers put together. Released in August 1991 it went silver on 1 September 1991. It subsequently went gold on 27 April 2001. That would be that were it not for the revised rules I mentioned earlier. In mid 2013 the BPI began a massive trawl of audited sales figures that have meant that titles that remained available either on CD, vinyl or download at some stage post 1992 could receive awards the labels might not have applied for. So it was that on 22 July 2013 the Various Artists compilation The Best Of 2 Tone went gold. With these retrospective awards only the highest award is actually made. In theory the album went silver as well at some stage, or would have if 2Tone still existed to make the application. So six of the label’s first twelve albums went gold, with sales of more than 100,000. In addition two EMI issued collections Too Much Too Young (The Gold Collection) by The Specials and Too Much 2Tone by Various Artists also got awards on 22 July 2013. The former was gold and the latter was silver.